Thats pretty old brother and incomplete too, there was also a bat who flown out of that hole they dug and disappeared in the dark Siberian sky! Our conclusion is, either it is true that the voices are from hell but the souls were shouting constantly at about the same tones, same volume and at about the same intervals, or somebody just mixed several voices to achieve this effect. If the answer were the latter, then he succeeded very well in blending many screams together. But the frequencies are too regular and the tones are too rigid. Furthermore the detailed exposition of this hoax was done by Rich Buhler, who with his team successfully proved that the whole story about about this "digging to hell" was fake! You can read the whole article here; and do read it all, you'll know about that "bat" too, its really funny though. The deepest hole scientist been able to dug is the Kola Superdeep Borehole "SG-3" which is 9 inches wide and 12.262 Kms deep. And guess what, it took them 24 years to dig that deep! And they found nothing super-natural there. and one more thing bro, you must have heard the Nepal Mosque Miracle. what do you say about it? if it is true? i mean do we have any authentic verification about the truth of this incident? I saw that too and wasnt able to come to any conclusion. After I read your post I thought I should try looking for some facts about it. After reading the below article, I was able to see the ropes, even the ropes moving up & down because of the weight and movement. For those who want to dig in some more, there are many video editing softwares which lets you extract the video in frames. I dont think its worth it... waisay bhi aakhiri ashra chal raha hai Ramdan ka. Story of the girl allegedly turned into a dog for disrespecting the Quran. 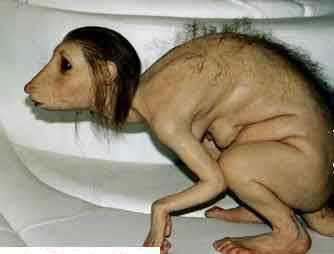 Where as the fact is that its a sculpture made by an Italian artist named Patricia Piccinini. However its seriously disturbing and ugly so viewer discretion is advised. Bro 4 the effort. i havent yet read the full article you linked above but i think tis true that this video is a fake. i mean if this was real it would have spread in the world after couple of hrs the moment it happened. and this dog girl you mentioned yeah i too saw a video of some "girl who turned into a lizard for disrespecting QURAN" it was from some Arab country. i saw it on u-tube like more than a year ago. Enemies of ISLAM do such things on purpose and don't know why we Muslims fall for such scams so easily. THREE POINTS SHOULD BE PUT AS LOGICALLY,FIRST IS THIS CAN BE POSSIBLE ACCORDING HADEES OR QURAN ? SECOND WHAT WAS SOURCES OF IT WHO DISCLOSED THIS RECORDING ? THIRD UNTIL TO DAY IS THAT HOLE IS EXIST ? MY PERSONAL OPINION IS THAT, THIS CAN BE TRUE,HOW? FIRST THERE IS IN HADEES ONE EVENT WHICH IS HAVE APPROXIMATELY SIMILARITY, ACCORDING ABDULLAH BIN OMER HE WAS PASSING BADR LAND AND SUDDENLY A MAN COME OUT FROM UNDER GROUND AND ASKED HIM WATER HE ASTONISHED WHEN THAT MAN CALLED HIM BY HIS NAME,SINCE HIS NAME WAS ABDULLAH HE WAS WONDERING IS HE KNEW ME OR JUST ASKED ME AS ABDULLAH AFTER THAT MAN ONE LION WHO HOLDING THE CHAIN OF THIS MAN SAID ABDULLAH DON'T GIVE HIM WATER HE IS KAFER (INFIDEL) THEN HE PULL HIM BACK TO UNDER LAND THIS INCIDENT BEEN TOLD TO SAYEDI MUHAMMED HE REPLY HE WAS ABU JAHAL,AND THERE IS MANY OTHER PROOFS BY AHADEES THAT SOUND OF PUNISHMENT BEEN HEARD. I don't know whats on your mind. Nobody here commented over the issue of "possibility" but this particular hoax, so quoting Ahadith in this regard is idiotic. Did you even bother to read my post and the references given? The researchers exposed it completely and yet you believe that this non-sense can be true! And the biggest proof of its being false that there is no record of such a deep hole dug by man. If the hole really exists why there is no record? The details about the deepest hole ever dug can be seen in my earlier post. I would love to see the authentic denial to that. Your first point is baseless as we didn't deny the possibility here. There are ahadiths in record which proves that Huzoor Sarwar-e-Konain heard the voices from a grave. Your second point is refuted by many researchers. Try to read the references given in my post and then if you feel like they're wrong then prove it. Otherwise whatever you say will be counted as your very own understanding which is ofcourse unauthentic to the masses. Your third point is again based on your limited knowledge in this. Try to search for it and you'll know the details about who disclosed it and how lame and fake it was. The very fast attested broadcast of this hoax was done in 1989 by Trinity Broadcasting Network which picked up this story from a Finnish newspaper "Ammennusastia", claiming it to be a proof of literal existence of Hell as taught in the Bible. And the last thing you mentioned that there is no child voice in the recording which apparently makes it real is seriously illogical. You accepted that the voices in that recording are high pitched or high frequencies. How can you be so sure that there is no child voice among all that noise? Is there a way to filter that? Even if you record a child's voice and then increase the pitch it and then mix it with all such noise, no one would be able to determine whether there is a child's voice among all that noise or not. Lastly, I request you read my post completely and also the references give. That might help you understand. I just got a really interesting question in my mind. If you believe this crap to be true or even anything close to it, then it means that one can physically reach the Hell without being dead because thats what the story claims. They dug so deep and then put a mic in there which means they physically reached hell. If that can be true then I would love to know whether can a living being be thrown deep into that hell or can the alleged hell residents escape through such route if they see it? SECOND YOUR QUESTION ABOUT IF THIS CAN BE TRUE THEN IT MEAN WE CAN PHYSICALLY APPROACH THE HELL? After reading this post I first thought I am a real fool who tried to help you understand that this whole lame junk is nothing but a hoax because its evident that you believe in the theory that you cant be wrong and I guess its really foolish to convince a person who simply dont WANT to understand. But then I thought I should do my best to stop such idiotic propagation. Provide your source regarding this idiotic claim that the actual recording was so high frequented and then later filtered by others. Provide any such authentic proof either by professional or by individuals that there is no child voice in that recording. Else we don't acknowledge your very own twisted understandings. Please provide the complete hadith here, also the proof that they used any such special mic for recording. There are several Ayahs and Ahadith from which one can get the understanding of after-life (Heaven/Hell). There is no need of such lame retarded propaganda to believe in truth. Though its forbidden to spread lies. Are you trying to say that Abu Jehl ran out of hell and this is recorded in hadith? Please quote the actual hadith. And stop trying to run away from the queries I asked in my earlier. You got nothing, not a single authentic proof to prove this retarded hoax as truth and yet you are trying hard to do so. According to your claim they dug 14 kilometers deep and yet you got no proof that such a deep hole exists, whereas I provided you the details regarding the official on-record deepest hole ever dug and that is only 12.262 kilometers. Seems like the only source of information you got in this regard is Youtube. Be and think what you're doing. And yeah! Remember that nobody here talking about the possibility issue. The issue here being discussed that whether this particular Siberian incident is true or just a lame hoax. I SAID THERE IS NO CHILD VOICE,YOU DENIED THEN PROVED TO E WHERE IS VOICE OF CHILD IN THIS RECORD ? I SAID THIS RECORD BEEN FILTERED AND YOU AGAIN DENIED THEN PROVE ME ? AND PLEASE TELL ME WHERE WAS AND ARE ABU JAHAL AFTER DEATH ? I cant be sure whether you're a retard by birth or this Youtube source of information turned you into such a buffoon. Anyways try to read the highlighted underlined text before posting more of your crap. We do NOT give a damn about your lame, retarded and totally idiotic perception. And I clearly mentioned in my earlier posts that we are NOT discussing the issue of possibility here but this particular hoax which was actually propagated by Christians and never held any authenticity among Muslims. So keep your perception to yourself and prove the authenticity of the story you mentioned. Denial comes after the claim not before it and I haven't even denied your claim yet. I simply asked you to provide any authentic proof of your claim and you know can't prove any of the crap you said. You accepted that it was you who first made a claim, also regarding the filtering of recording and now foolishly asking me to prove it. I've seen such idiotic tries to run away from the facts by Deo/Wahabi, never seen it coming from a Sunni. And please tell me what Jew influence have to do with this? Why would Jews hide such an incident? Do you think Jews don't believe in Hell or what? I mean whats you point here? Why would they hide the fact that they have the deepest man-made hole in the world? On the contrary if they really had the deepest man-made hole in the world they would've advertised it as much as they can because it would've been counted as one of their biggest Scientific achievements and economically would've helped the Ministry of Tourism. That hole has nothing to do with Muslims either so don't you try to whine about Jewish enmity towards Muslims. So far all your claims are based on your own assumptions. By presenting this lame Jewish influence you again proved that you have nothing authentic in this regard. You can assume whatever you want and we simply don't give a damn unless you come up with some authentic stuff. And also please provide the source of your claim regarding the high influence of Jews in Siberia. So far I got this from Jewish Virtual Library. With the establishment of Soviet rule in Siberia, however, Jewish communal, cultural, and national institutions were gradually destroyed. Many wealthy and middle-class Jews left, most of them for China and a few for Palestine. The majority of the Jewish refugees living in Siberia returned to their homes in Poland and Lithuania. In 1926 there were only 32,750 Jews: 9,083 in the region of Irkutsk, 5,505 in the region of Tomsk, 4,389 in the region of Omsk, 3,040 in the region of Krasnoyarsk, and 2,301 in the region of Novosibirsk. Some 28,972 Siberian Jews lived in towns and 3,778 in rural districts. In 1939 the number of Jews rose to 63,844 persons, most of them in Khabarovsk Krai (district) – 22,473, including 13,291 of the Jewish Autonomic region – Birobidzhan; Novosibirsk district (11,191); and Irkutsk district (8,504). Except in the Jewish Autonomous Region where the Jews constituted 18.57% of the population, the Jews were a small percentage of the total population, only 0.6% and 2%. Most Jews lived in the capitals of the districts. The Soviet rulers exiled thousands of Zionists from European Russia to the most outlying parts of Siberia. Among the exiles was the poet Ḥayyim *Lenski, who described life in the concentration camps and the scenery of Siberia in his poetry. In 1928 the Soviet government assigned an area in eastern Siberia to Jewish settlement, and in 1934 it was declared an Autonomous Jewish Region (see *Birobidzhan). During World War II large numbers of Jewish refugees from the areas occupied by the Germans reached Siberia, and some of them remained there after the war ended. According to the 1959 census there were 12,429 Jews in the Novosibirsk oblast, 9,458 in the Omsk oblast, 10,313 in the Irkutsk oblast, 2,691 in the Buryat-Mongol republic, 8,494 in the territory of Khabarovsk, and 14,269 in Birobidzhan. The census, which did not cover the whole of Siberia, registered a total of 57,654 Jews (i.e., those declaring themselves as Jews). Some 53,266 (92.4%) lived in towns; 9,970 (17.3%) declared Yiddish as their mother tongue (excluding Birobidzhan – only 4,373, or 10%). In Novosibirsk, which became the capital of Siberia, the Jewish population (with a synagogue and an old Jewish cemetery) numbered in the late 1960s about 25–30,000, consisting of a small nucleus of Siberian Jews who had been there from czarist times – and their descendants – and mostly of Jews who had been evacuated from the western Soviet Union during World War II. In 2002, 3,330 Jews remained in the Novosibirsk oblast and 14,579 in the entire Siberian district. About the hadith and Abu Jahl keep your stinky mouth shut as I already asked you to provide the complete hadith here. So rather than jumping around and asking questions over questions, first reply to the queries due on you. Please read my post and answer. I am not gonna bother replying your junk. Let me elaborate the queries I asked once again for your ease. 1) According to Shariah Law the claimant is responsible to the required evidence in support of his claim. So please provide AUTHENTIC material in regard to your claim that this hole crap is real. 2) You made the claim that there is no Child voice in that recording. So please provide some authentic analysis from professionals which proves that there is no child voice in that recording. 3) You also made the claim that the recording is filtered. So please provide some authentic analysis from professionals which proves that this recording was filtered, and also the information about those who processed this audio. So far you're running away from the queries been asked to you and according to forum rules its prohibited to do so. Reply the queries accordingly before posting any further material or else your posts will be deleted without any warning. Note: Persistency may lead to a temporary/permanent ban from the forum. SECOND SIR PLEASE SHOW ME WHERE IS CHILD VOICE ? You are a retard and you will remain the same unless you try to understand that you can be wrong. I never said that you claimed about the story, but you did claim about the other two clearly mentioned things in my queries, first the child's voice and secondly the filtering of that recording. You can't do anything but whine. You got nothing in support of your retarded claims. So keep on whining while I keep exposing your height of stupidity. Though I made it very clear through various official reports that this whole story is nothing but a hoax. But I think you never bothered to read the links I've given in my posts or else you wouldn't be whining about the child voices and the filtering. According to our observation when playing the file no.2 (pure screaming), there were "many" voices aggregated together to produce such a result. However, that "many" would never come close to a huge number for example a million. If we blend in a million voices together and we assume these voices come from different individuals who have different voice patterns, one would expect it to have some kind of "smoothing" effect to the long term average curve. That is, perhaps, a bell-shape or a more uniform curve than what is shown in Figure 2, to be observed. The frequencies distribution would get more evened out. On counter-proving our arguments, the souls may have quite a monotonous voice such that the combined frequencies would only be concentrated on the ranges (coincidentally?) same as those in Figure 1. Then these may be like duplicated folks of the same breed. Technically, on the other hand, this may also possibly be the results of artificially mixing only several different tones of screaming so to produce this grand effect of millions souls screaming. The sound is quite "mechanical" when it is played in a long run. You can do a little experiment on your own to test this. Play the sound clip by using Media Player (or anything that gives you a slide-bar). When it is being played, move the slide-bar back and forth randomly. While doing this, you will be surprised to hear that the sound was still playing smooth and continuous. Why? That is because you were listening to an aggregated result of voices that got randomly "pieced" or "cascaded" together using a mixer. I know your height of stubborn stupidity will make you say that all those tormented souls were really screaming in a same tone, same volume and same intervals! But pardon me kid! Not everyone around here got a brain like you! Now a few facts about Hell from Islam. "And surely, Hell is the promised place for them all. It [Hell] has seven gates, for each of these gates is a [special] class [of sinners] assigned". Now according to your retard belief there could be an "Emergency Fire Escape" thing in Hell dug by humans which is located in Siberia! "We were with the Messenger of Allaah and we heard the sound of something falling. The Prophet said, "Do you know what that was?" We said, "Allaah and His Messenger know best". He said, "That was a stone that was thrown into Hell seventy years ago and it was falling through Hell until now". So, based upon the assumption that this stone is a normal stone and it continued to fall at a constant speed, then using the formula h=1/2 gt^2 where I am reliably informed that h = the height we are looking for, t = time it’s been falling in seconds and g = 10 metres per second^2 as some kind of constant. Which means that hell is like multi-trillions and quadrillions of times bigger than we can ever imagine. Reply the queries due on you with authentic material or if you find yourself unable to answer them then keep your mouth shut until you find some answers. WHAT WAS MY QUESTION ? ASKING ABOUT HADEES SHAREEF IS THAT MAKE YOU SO ANGER ? PLEASE SHOW SOME HONOURABLE STANCE EITHER ANSWER THE QUESTION OR DELET ALL TOPIC,THIS WAY YOU JUST SHOWING YOUR MUSCLE NOT EDUCATED MANNER. You are not in a position to ask question now retard because you got many question due on your end so first try to find the answers them or simply shut up. My stance is as per the general rules of debate/discussion Mr. Moron! I am not responsible to reply any of your questions unless you answer the queries due on you. Now stop the whining and try learning the most basic rules about debates/discussion. I CLOSED THE DEBATE ON THIS SUBJECT NOW ON READER TO DECIDE WHETHER I WAS WRONG OR RIGHT. This is nothing new for us. We've seen many of Deo/Wahabi running away from the discussion in this fashion. Whatever I said to you is proven by your posts. You've been proved a persistent idiot with your very own words, an idiot who first tries to use a Hadith in support of his views and when asked to provide the complete reference he says "I AM SEARCHING ON,BUT DID NOT FOUNDED UNTIL YET,". You've been proved a liar as you failed to provide even a single piece of evidence in affirmation of your claims. And now you're whining about misbehavior. Calling an idiot a idiot is not misbehaving, its to make him realize what kind of crap he is uttering. The thread is visible to everybody so let them decide who is running away from the facts and queries. Now go.. shoo ... run and find some place to hide and stay there until you find some piece of evidence in this regard. TOPIC LOCKED FOR BOTH PARTICIPANTS! Let the members Vote. Pehlay meh socha kerta thah kay dunya kee har shaytaani kaam kay peechay shaytaan kee support heh, mera view badal gaya heh, har shaytaani kaam ko support kernay walay shaytaan nahin AlTeejani heh. Dunya ka sab say bara ajeeb o ghareeb ajooba, Alteejani the shaytaani, all the heretical kuffria believes are found in him, saint John declared the secret of number of beast and he is here to preach the Gospel the good news of saviour lord Jesus christ who died for the sin of mankind, god become flesh the lord of Lords Jesus christ the number of beast is 666. Sybarite baee kissi banday kay puttr say wasta dalen, yeh khud be'imaan heh aur baqiyoon ko bak bak say gumra keray ga.